Hello, we are looking to start running some small ball micro tournaments on Tuesday, Wednesday and Thursdays with games starting around 5:30 PM CST with the last game being around 9:00 PM CST. Looking to run 4 to 8 games a night with buy ins from .10 cents up to 1 dollar with some freerolls for the league participants. Please locate these games in our online poker lobby under the Tournaments > Private > All > Tabs. This series is designed for new players who are working on building their bankrolls up from either the minimum deposit or no deposit. This is a great tournament series for new players and people with small bankrolls. Minimum risk for some nice payouts. If you would like to learn or play real money Texas Holdem Poker, win cash and help others at the same time while you play or learn, then make sure you click on one of our Americas Cardroom banners and download the free poker software. Once you have our software just open it up and create your new player account. It only takes a minute or two and after you’re done you can immediately start playing our freerolls. Please remember to send an email to terry@poker4acause.org after you have downloaded the free software and created your free player account or register at poker4acause.org to be added to our list of players and to receive special discounts, coupons and freeroll info. Helpful links > Chat page > chat with other members, ask questions or get help. Poker Tips > Get helpful poker tips. On behalf of everyone at Team P4AC Poker and Americas Final Table we would like to welcome you to the team. Good luck and run good. It’s that time again when a lot of people are going to need help. Team P4AC Poker and Veterans House needs your help to brighten the lives of those less fortunate or who have fallen on hard times due to any number of reasons such as medical issues, job loss and countless others. Help us this year by volunteering or making a donation of food – non perishables & meals ready to eat, clothes – childrens and adult sizes, money, toiletries, feminine products, gloves, coats, toboggans, and can openers. Volunteers needed to drive patients who have no transportation to appointments, help pack food boxes for struggling families, help with event set ups and tear downs and much more. For more info or to get in touch email terry@poker4acause.org. Please you can drop off donations, sign up to be a volunteer, inquire about work opportunities, sign up for free poker classes or to play in our Combat Poker League and play poker in support of charity at our offices at: 2521 Merrell Road suite 104 Dallas, Tx 75229. Call 214-668-8836 to schedule drop off to make sure someone is there to receive your donation or to schedule a pick up. If you like to play poker or want to learn for free you might consider joining Team P4AC Poker and help support Veterans House and the people they help just by doing what you love and having fun playing poker. When you join P4AC Poker either our live poker room in Dallas, Tx or online at Americas Cardroom or Carbon Poker and create a free player account, anytime you play in any real money game with a rake or a fee you will be helping to provide food, shelter, transportation, access to medical and more. It costs nothing to start and we are here 24/7 for help. Visit our chat page P4AC Chat, email terry@poker4acause.org or skype (holdem1eyejack) if you have question or need help. If you would like to join our team of poker players who are learning to play for free or playing in real money cash games and tournaments and winning real money in our freerolls, private and special events just click on our Americas Cardroom banner and download the free poker software. Follow the help wizard and create your new free player account. It takes less than ten minutes and you can start playing in the freerolls immediately after your player account is set up. People ask. Q. How does playing freerolls help charity? A. After you cash in a couple of freerolls you will have some real money on your player account so now you can get in some real money tournaments and try for some bigger cash prizes. As you play in these games you will generate revenue for the charity from the game fees. Oh did I mention that your player account will help support charity over the entire life of the account. Come on and let us help you build a bank from scratch if you like. It will not cost a thing. Since you are a member of P4AC you can receive free poker training and help to improve your game and become a better player for free. Maybe you and your friends would like to play a certain type of game. Contact us and we can put that game in the tournament list for you and your friends to play. If you would like to join our poker team, comedy team or music & entertainment team send email to terry@poker4acause.org. Come join us in our freerolls and learn to play the most popular poker game Texas Holdem. Best of all you can start totally free. Just click on one of the Americas Cardroom banners to download the free software. Once you download the free software and create your new free player account. Don’t make a deposit Start playing in the freerolls. Once you place in a couple of freerolls you can use your winnings to enter real money tournaments and have part of your rake and tournament fees go to charity. As a member of our team you will have access to free poker training and we give our new players the right games for them to build their bankrolls from nothing. You will also have access to our newsletter and video blogs. We have various videos from poker training to videos of the people you help by playing or learning poker with us. So what are you waiting for. Send me an email today to terry@poker4acause.org to join our team of poker players or to just get info on how to help support Veterans House. 25K Poker Tournament & Live Broadcast. Yes today at 4PM Central time is the day of our 25K guaranteed Texas Holdem Tournament and I will be live on my Youtube Channel. So please stop by my chat page and add a question or comment about Team P4AC or Veterans House. Ask about how we raise money from free online real money poker. I look forward to hearing from you today. This of course is if I can get the feed to work. So help me out and stop by and let me know if you can see the feed, ask question or just visit. If you want to learn or play real online poker for free be sure to click on and download the free poker software for both Carbon Poker and Americas Cardroom. It should take less than 10 minutes to create an account at both rooms. Once this is done just send me an email to terry@poker4acause.org with your new screen name to be added to our team of online players. Visit P4AC Chat to see live stream!!! 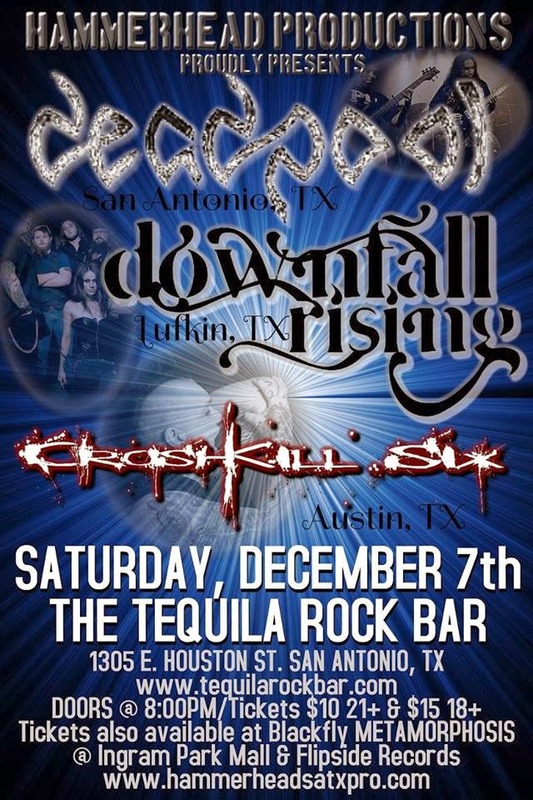 Deadpool, Downfall Rising & CrashKill Six at Tequila Rock Bar! DEAdpOOL – ELEMENTS OF THRASH, PROGRESSIVE AND DEATH METAL; IMPECCABLY BLENDED BY IDLE HANDS TO BRING INTO BEING THE EVOLUTION OF MODERN METAL. CrashKill Six continues to prove that they are some heavy hitters in the scene. Check out the newest video from CrashKill Six! Pistol Whippin Ike returns to Curtain Club! for a damn good time and see The Circle get their plaque. Please help our friends raise money for their next project. They will make it worth your while. Follow this link to donate and get your prize packs. This will be a hell of a show! Get down here this Friday night to The Rail Club in FT. Worth. You don’t want to miss this one!! !